Coronation Cord – Cheater Embroidery? Cheating at hand embroidery – how to give the impression of hand embroidery, without really hand embroidering, and yet still call it hand embroidery. In a sense, this is what the once-popular “coronation cord” does. 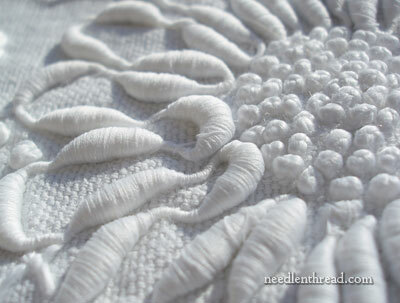 There are certain types of stitchery that could be considered, in a way, “cheater” embroidery. Today, I’m going to show you one of them, by looking closely at an antique tablecloth. Then we’ll chat a bit about the technique and its history and uses, and then I’ll give you some resources. By the way, by calling it “cheater” embroidery, I’m not saying it’s a bad thing. The effects of coronation cord can be lovely! 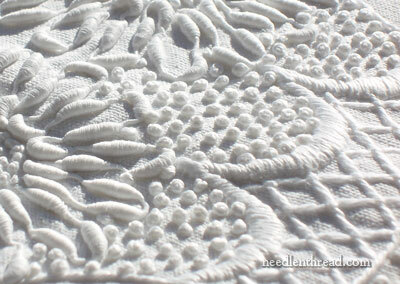 Check out this wonderful textural embroidery on this antique table cloth. We talked about vintage linens the other day, remember? I was so happy to get my hands on this piece, and not because it is exceptionally elegant. Not because it is exceptionally fine. Not even because it’s linen – because it isn’t. This is a highly textured, somewhat coarsely embroidered table cloth made out of very heavy cotton. It’s a regular weave cotton, not a twill. It’s reminiscent of cotton duck, though with a bit more drape than today’s cotton duck. Yes, it’s heavy. Yes, it’s coarse. But it’s…. oh, yes. I like it. I love the texture. There’s a certain charm in its coarseness. It is an everyday “dress up” tablecloth, with something a little incongruous in its parts, but strangely, it all works. Here, you get a partial view of what the piece is – a barely round cloth, edged with a bold crocheted edging, and embroidered with a bold and chunky design incorporating a basket of flowers, some lattice work, some scrolly stuff, lots of French knots, and a flower motif. It’s the stuff that makes up the flowers that grabbed me. Notice how the petals look as if they’re made out of an ongoing line of strung-together cocoons? And there they are again – those wobbly flower petals that jump off the fabric in a kind of relief, striking in their texture and in the shadows they cast. Here they are, close up – those wondrous “cocoon strings,” manipulated into abundant, bold flower petals. If you didn’t know what you were looking at, and you were not examining the piece up close, you might be tempted to think that the embroiderer undertook to stitch the flowers in some strange and bulging “trailing” technique (satin stitching over cord) and worked all those petals that way. But in fact, the stitcher cheated. What might look like satin stitch (albeit lumpy, in a regular sort of way), is actually applied cording, called coronation cord, or sometimes rice cord. Coronation cord is an overcast cording that looks a lot like little cocoons all strung together. When described that way, it doesn’t sound too pretty, does it? But some very interesting effects can be achieved with coronation cord. Coronation cord is not properly “embroidery” – the thread doesn’t pass through the fabric in any specific type of stitch to form the decoration – but, when used on the surface to adorn linens, it’s often called “coronation cord embroidery.” It falls into the same category as soutache embroidery, which is actually adornment of fabric by couching braiding onto it in intricate patterns. Coronation cord is something that I tend to keep an eye out for when I’m looking at vintage linens. I don’t know why I’m so attracted to it, but I do find it fascinating, and I like to find linens that incorporate it. Besides the coronation cord on this particular piece, there’s quite a bit of other embroidery, too. This is, if I have ever seen one, a perfect circle of perfect knots. Such uniform, chunky knots – all so evenly spaced, all so consistent in their size. Each flower center on the cloth (there are six large flowers on the whole cloth) is made up of patches of knots just like these, and each patch is perfect. The knots are colonial knots (as opposed to French knots). And they are very nice knots indeed! 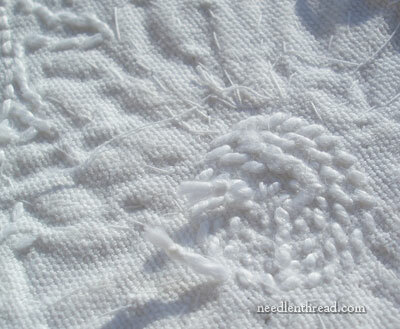 On the back of the cloth, you can see the back of the round of knots that work out into a kind of spiraling circle. All around that area, you can see some longish threads that seem to move haphazardly all around the cloth. That is the couching thread used to secure the coronation cord. You can see that the other stitches used in the project include satin stitch, which is nicely padded and executed, lattice work (for the basket), and a bit of outline stitch and some other satin stitch in the form of satin stitched dots. There’s a lot of bold work done on this piece – it is not “fine” embroidery. If it were worked on a cotton sateen using a non-mercerized thread, it would remind me of a take-off on Mountmellick embroidery. With all those knots, it also reminds me a bit of candlewicking. I can imagine the stitcher, used to doing candlewicking, saying to herself, “You know, self, I’m going to incorporate some other stitches into this project – and maybe some of that weird looking cord.” The thread reminds me of thicker candlewicking thread. 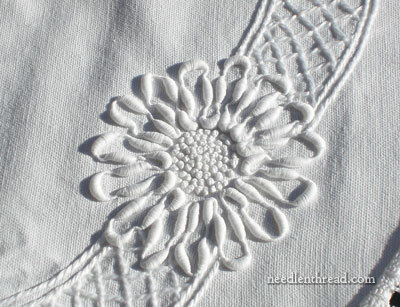 There is no fine embroidery floss on this piece, nor any typical perle cotton or cutwork cotton. Coronation cord meandered into popularity at the end of the 1800’s and only enjoyed a short stint in the lime-light, waning in popularity around the 1920’s. 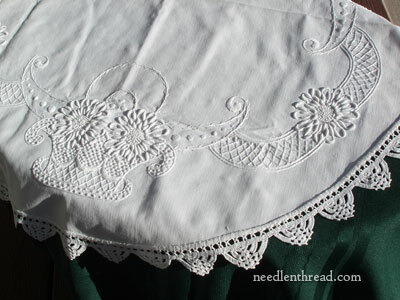 It is probably better known by its uses in crochet and tatting projects, and in fact, it’s more common to find it on vintage linens as part of a tatted or crocheted edging and insert. At Cate’s Linens, you’ll see coronation cord used as part of the edging on a linen, and also marking out (in color) a whole design on a pillow case. If you hope over to Etsy, you’ll see coronation cord making up part of an insertion design. You can check out a lacy piece heavy with coronation cord at Tatting and Other Craziness. There’s a gorgeous linen embellished with irises worked in Coronation Cordon Yarn Journey. This is one of the most attractive examples of coronation cord embroidery I’ve seen. 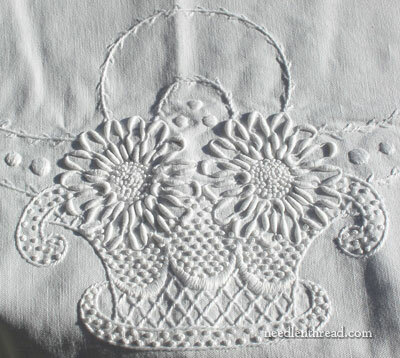 This already-sold antique table cloth on Etsy, which features baskets and flowers worked in coronation cord, is worth taking a look at. The flowers are similar to those pictured at the beginning of this article. There’s another nice linen centerpiece decorated with coronation cord on Pretty Petals – just scroll about half way down the page. You can occasionally find linens adorned with coronation cord through vintage linen dealers. If you search eBay for “coronation cord” right now, there are a couple nice examples on there. Home Needlework Magazine, August 1914 on Digital Archives (PDF) – coronation cord in crochet and tatting, also some information on cord embroideries. You can also find some more information on coronation cord on fabrics.net, where there’s a little history of the stuff. You can find some further reading on Coronation Cord here on Needle ‘n Thread, with a comparison of vintage coronation cord with coronation cord made today. Coronation cord dropped out of popularity in the early 1900’s and it hasn’t really regained that status, so finding coronation cord at any typical needlework retail shop is a difficult proposition. Sometimes, you might run across vintage linen dealers selling it by the yard (for rather overrated prices). However, you might find it new at specialty shops that have a concentration of lace-making supplies. If you’re looking for it online, Lacis carries it for a reasonable price in 2 yard put-ups, or by the foot. G’day there Mary, this is terrific, as in wonderfully made, depicted and explained. Thank you. Cheers, Kath. It’s beautiful! I don’t call it cheating because any kind of stitching to get a beautiful piece is good. I’ve never heard of it before and now I think I’ll do some web searching. I am amazed that the iris motif in the Coronation Cordon Yarn Journey sample is worked in one continuous line. The line starts in the leaf, goes up to form the complete blossom, and returns to finish the leaf – Amazing! but I bet ironing this tablecloth is a REAL PAIN! Janet. Hi, All – Thanks for your comments on coronation cord. Pretty neat stuff, eh? Thanks, also, for adding in the resources. You’ll see at the end of the post that I linked to Lacis to find new coronation cord. If you search used book sellers, you might find a pamphlet out there that focuses on coronation cord, too – the Application of Coronation Cord in Modern Needlework (or something to that effect). I have a copy of it; maybe I can put it on the website, if there’s an interest in it. It’s an old little pamphlet, but interesting. What an amazing post today Mary – I have seen this used on vintage linens but did not know what is was.. I am all for cheater embroidery when the results are as amazing as this. I’d love to see the pamphlet too. I have been trying to find out more information about something called ‘Cornpad embroidery’ classes were run by Sue Thomson in Australia and her self published book is out of print. There is a little info on the internet – but more to discover I am sure. I don’t know that I’d call it cheating either. I mean, we don’t call it cheating when we couch any other threads, do we? Although, if you were expecting boullion knots, maybe it is cheating. Hmmm, nope, still not cheating. I found some Coronation Cord in an antique shop a few years ago, and got a few packages. I would have bought it all, but the seller had it priced on the high side. Piecework magazine had an article on Coronation Cord a while back, if it weren’t for that, I’d have passed the packages by without a 2nd thought. I don’t think it’s cheating, either, but it is lovely. I’ve seen coronation cord on vintage bedspreads, but didn’t realize that it was an actual cord as opposed to an embroidery technique. I love the white-on white, but I bet it would look amazing on something dark like blue or black, or even on an ecru cloth! This is too funny! I looked at that “whole” site and THIS is the ONE that I wanted! I’m just glad you got it. I think the shadows it casts are just beautiful and the sweet baskets and flowers and I truly LOVE that piece. When I have more time, I intend on looking through more of the links you’ve given us about that type of needlework. I’d never heard of it before. AGain!!! Thank you for sharing these things with US! I feel so lucky to have found your site. Though I always am in amazement of how much you write, make and accomplish, don’t you EVER sleep? These are beautiful!!! I had never heard of coronation cord before. I love it!!! I am especially attracted to the iris piece. It is amazing that it is one continuous piece. Wow! That is the most interesting thing I have seen in embroidery and it is beautiful. I love the texture the cord creates. I just want to run my fingers over it. One reason why I like crewel work is the textured look it gives. But, I don’t think it is cheating. There alot of actual embroidered elements on that table cloth and it is like adding beads or charms to the work. Really thinking outside the box – I love that! I have some vintage pieces that use this cord as a trim. The first time I found coronation cord, I thought that someone actually hand-wrapped those rice pads, not thinking it was a tape braid type of thing used as a shortcut like Ric-Rac tape! My balloon was burst a little when I found it to be abundant! Among all my other “vintage” collecting, coronation cord is purchased whenever found. Through the years I have found different “sizes” and different colors. Very cool stuff! Anything that provides texture is highly appreciated. Especially tone-on-tone (white-on-white) texture. I had an interesting conversation long ago about the actual “marketing” of this stuff — when the magazines & ladies “home” magazines were so popular (late 1800’s/early 1900’s), they first introduced it as “rice cord” — nobody bought it. Then they tried to market it as “torpedo cord” — again, no takers. Then they fell upon “coronation cord” and it WORKED!! It caught on. So those “ad men” do earn their keep sometimes, I guess! I know that Lacis has long been trying to have it reproduced and it is only recently that they came up with a workable product. Glad they perservered — it is cool stuff! Thanks for bringing it to light, Mary. Thanks for the information, Bobbi! I knew you’d be a good source for knowledgeable tidbits on this stuff! Funny about the name game, isn’t it? I wonder how “cocoon cord” would’ve gone over?! Coronation cord was also used in tatting back in the day. The connections were made at the narrowest points. Just another bit of history. I’ve loved coronation cord for ages and am always looking for examples of it. I have some original cord on cards–I was so excited when I found it (the shop owner had no idea what it was). I didn’t know Lacis sold it–great news! Thank you for posting about coronation cord. I have a couple pieces of linen with this technique and have been wondering about how they were done. I didn’t realise there were so many others out there collecting (amassing?) beautiful old hand-worked linen. I started furtively with “fancy work” at op shops. Some damaged, yet pretty pieces, adorn my tea pot cosies. I have graduated to acquiring many examples of different embroidery and lace techniques, but I haven’t seen Coronation Cord before. Perhaps it never made it to Australia. Hi Mary. I really enjoyed the latest email regarding the Coronation cord. I have never heard of it before either. I am so pleased I found your website through Country Bumpkin and enjoy your regular emails and a glimpse into your busy yet productive life. Mary–Thanks for posting this article about coronation cord. It’s wonderful stuff when couched–sort of a cross between passementerie & the vermicelli work on your current project. When used in braiding, it makes a very textural kumihimo cording. To my knowledge, it was produced in several sizes & hasn’t been in production since the 1920’s. When I checked Lacis, they are selling the 9/16″ but I can recall seeing both larger & smaller versions. And are we sure they are selling a newly made product rather than a collection of “new” vintage materials? In any event, I had no clue that my stash of white, ivory, rose & yellow coronation cord might help fund my retirement! LOL As others have noted, shop owners rarely know what it is so there are some 50c to $1 bargains out there. Very interesting! I’ve never heard of this. Lacis’s web site not only has the cord but a publication on it. I’m going to look into it further. Thanks for the continual enlightenment. I’ve seen this (can’t remember where) and certainly didn’t know what it was called. Thank you for adding to my education again Mary! 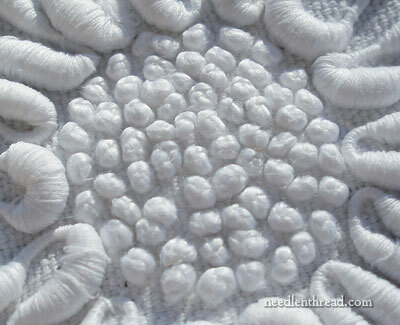 I have a large “doily” type piece with this one it, along with embroidery and a hand-crocheted edging around it. I LOVE it!!!! I’ve seen Coronation cord before! I think it was on a piece in my mother’s house – it is SO very familiar! I recognised it in an instant. Thankyou for telling us what it is 🙂 Fascinating! Thanks for this, I found it very interesting. I would like to try using coronation cord and wish it was more widely available. Would love to see the pamphlet if you put it on the website. Mary, what a delightfully informative post – you never disappoint! This one is particularly interesting – thanks for all your efforts! Loved this post! Your pictures are excellent. I so enjoy checking in with you and watch what you are working on. Hi Mary, I think you can safely call yourself Mary Corbett a.k.a. the Encyclopedia of Embroidery. 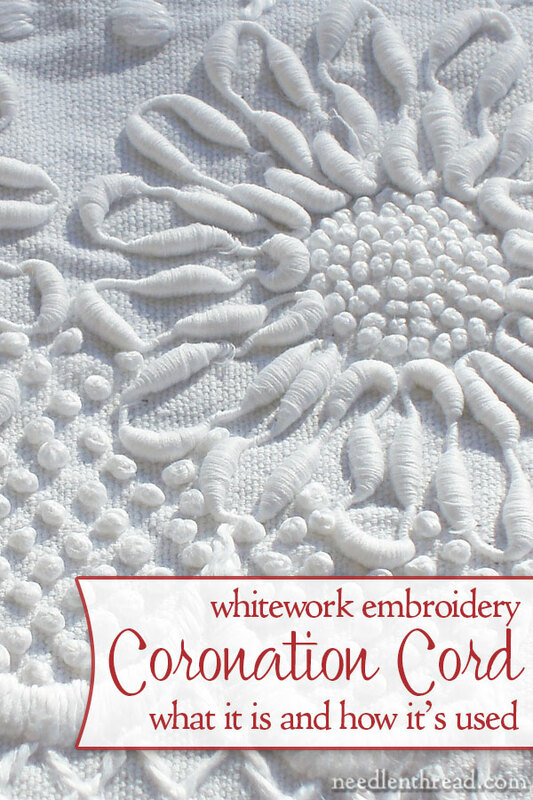 In recent PieceWork Magazine they had a lovely article on Coronation Cord that contains instructions on how to embellish a pillowcase with coronation cord. Coronation cord is carried by http://www.lacis.com . It shows it in ecru and it’s available in packages of 2 yard lengths. It is also available by the yard. If you required a lot for say a tablecloth you can obtain 50 yds. for $75. You receive a 10% discount for any amount over 24 feet. I do not know if they have it in white, however there is a phone number where you could call them to find out. I can’t see why using this cording is cheating. I don’t think it is any more cheating than stitching down gimp or gold thread to fill a large space or make a pattern. It is a matter of expediancy especially for homewares. I have bought Lacis cord and frankly I found it not white or well bound not nice and chunky as the original. I think it is a shame that the machine that made the cord apparently no longer exists?! There could be a 21st century renewal of this unique method of embroidery. Machines in early days were usually made to do a particular task. Nothing else and this really ensured that there was less likely to be muck ups and it would be easy to sort out a break. I have a 1896 Gegauf hemstitcher (now Bernina) that is all it does. Was once a treadle now it can uses both forms of power. It is a beast of a machine and so simple to use. If anyone can appreciate good engineering it is a joy to use. EXCELLENT DISCOVERY BY ME.THANK YOU SO MUCH MARY–BANI. Previous Previous post: Winner of Home Sweet Home!